On average, most people wait seven years between first noticing their hearing loss and finally take action. If you or a loved one are experiencing any of these hearing loss symptoms, it may be time to book a hearing evaluation. Denial, or minimizing a hearing loss, occurs frequently. People incorrectly associate it with aging or a disability. They simply ask people to talk louder or repeat themselves. The onset of hearing loss is usually gradual – making it easier to ignore or go unnoticed. It’s not always recognized for what it is – instead, it’s other people talking too softly or mumbling. It’s relatively easy to work around – You can just turn the TV up louder or avoid places where it’s more of a problem. Frustration – when they constantly have to repeat themselves. Misunderstanding – your withdrawal from people and activities may be misinterpreted as rudeness or disinterest in others. Concern – If you are unable to hear warning sounds like smoke detectors, alarms or sirens. Confusion – when you answer incorrectly, don’t respond at all or replay the wrong information. There are four main types of hearing loss. One of the first steps in treating hearing loss is to discover the extent and the location of the damage. When the type and category are determined, we will be able to determine the appropriate treatment. We work hard to help each and every one of our customers find the best solution to their hearing loss. Mild hearing loss – keeping up with conversations, especially in noisy surroundings is difficult. Some soft sounds are missed completely. Moderate hearing loss – difficulty to keep up with a conversation without the use of a hearing aid. Soft and moderately loud noises are not heard. Severe hearing loss – group conversations are possible only with a lot of effort, and lip reading skills. Profound hearing loss – rely mostly on lip reading and/or sign language. Communication without a hearing aid is not possible. As resilient as the ear is, there are still countless factors that can cause hearing loss. Hearing loss can range from minor hearing issues to complete and total deafness. Causes in the outer ear can include a plugged canal due to ear wax, and infections of the auditory canal. Usually these are easily fixed problems if you act quickly to avoid hearing damage. Many physical problems can affect a person’s hearing including, inflammation, fluid behind the eardrum, perforations of the eardrum and otosclerosis. Most of these problems can be addressed with medication or surgery. If surgery is not an option a hearing aid can be an effective way to aid your hearing. Most instances of hearing loss are caused by problems in the inner ear. Loud noises, taking certain types of medication, skull fractures, as well as the general aging process are the main causes. These things cannot be addressed medically but a hearing aid can aid in correction. Depending on the severity of the hearing loss there are many hearing loss treatments available. 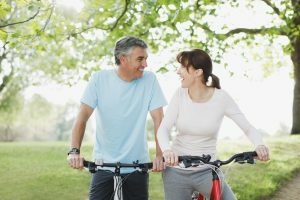 Surgery, listening devices, hearing aids, cochlear implants, signaling and text displays are just a few of the treatments that can help your hearing loss and increase your quality of life. Talk to your hearing specialist to figure out the best option for you. Hearing aids are awkward and uncomfortable. Today’s hearing aids are comfortable, stylish and discreet to the point of being invisible. If I had a hearing problem I’d know about it. Quite the opposite is true. Loved ones notice first – a person begins to compensate for the very gradual changes by asking others to repeat words, turn the TV up louder, possibly even reading lips. Allowed to continue, these habits mistakenly make the sufferer believe there is no problem, or that it has gone away. Amplification will make the damage worse. False. The truth is ignoring your hearing loss can progress it further and cause permanent damage. If I had hearing loss my doctor would have told me! A small percentage of family doctors screen for hearing loss during a physical exam. Your family doctor only ever talks to you one on one in a quiet environment and may not have noticed the challenges you may face in daily life. A mild hearing loss is not bad enough for a hearing aid. Everyone’s hearing loss and listening needs are different. By working with your hearing instrument practitioner, you can determine if a hearing aid is needed and how much it will improve your hearing. Hearing loss prevention is going beyond protective hearing, even when we have already suffered a hearing loss, we still need to be diligent to protect the hearing that we still have. Whether or not you have hearing loss, we offer a range of hearing loss protection to suit your needs. For more information on hearing loss or to schedule an appointment, don’t hesitate to contact us today at (604) 795-5367 (Chilliwack), (604) 466-3937 (Maple Ridge) or (604) 541-3937 (White Rock)!